The 2017 Los Angeles Auto Show is just around the corner and Mazda just announced its plans to reveal an updated Mazda6 sedan … with turbo power. Yes, you read that correctly — Mazda is adding a new engine choice to the Mazda6 sedan by taking the current 2.5-liter turbocharged inline four from the CX-9 and implanting it into the company’s flagship sedan. One of the current criticisms for the current Mazda6 sedan is its lack of engine choices. All new Mazda6 sedans come only with the company’s latest 2.5-liter Skyactiv-G naturally-aspirated gas inline-four with 184 horsepower and 185 pounds-feet of torque, mated to a six-speed automatic. While it is adequate for the car, many of its competitors offer turbocharged inline-fours or the choice of a naturally aspirated V6, both of which can put the Mazda6 in the dust in a straight line. Now, it seems Mazda is seeking to address this complaint by fitting the latest Mazda6 with the company’s latest turbocharged Skyactiv-G four-cylinder. The latest turbo-four from Mazda displaces 2.5-liters and was first introduced on the latest Mazda CX-9 crossover. There, it’s good for 250 hp and 310 pound-feet. Mazda didn’t say much else about the new turbocharged Mazda6 sedan. And that’s probably because the company is waiting for its press conference on November 29 to spill the beans. While we think it’s just another engine addition, it’s too early to tell if Mazda chose to market its latest turbocharged sedan as a return or successor to the “Mazdaspeed” line. Mazda previously produced sportier variants of its cars, notably older versions of the Mazda3 hatchback-based Mazdaspeed3 the older Mazda6-based Mazdaspeed6. They featured turbocharged engines, sport-tuned suspension, steering, brakes, and a sportier body kit. In the latest press release, Mazda Motor Corporation confirmed the introduction of a new turbocharged Mazda6 sedan. Other major changes involve the inclusion of cylinder deactivation for the pre-existing naturally aspirated 2.5L inline-four currently serving duty in the Mazda6 and the CX-5. This means drivers can benefit from a slight boost in fuel economy as the engine actively disables a few engine cylinders when cruising at speed. Also included in this list of changes to be implemented, Mazda plans to detail some additions to its i-Activsense package of passive and active safety systems for its cars. The i-Activsense system is essentially Mazda’s way of grouping its driver safety package that’s included on all of their vehicles. The latest revision adopts changes to the Mazda Radar Cruise Control or MRCC. Following its update, it will be able to bring the car to a halt, and accelerate from a stop in stop-and-go traffic. 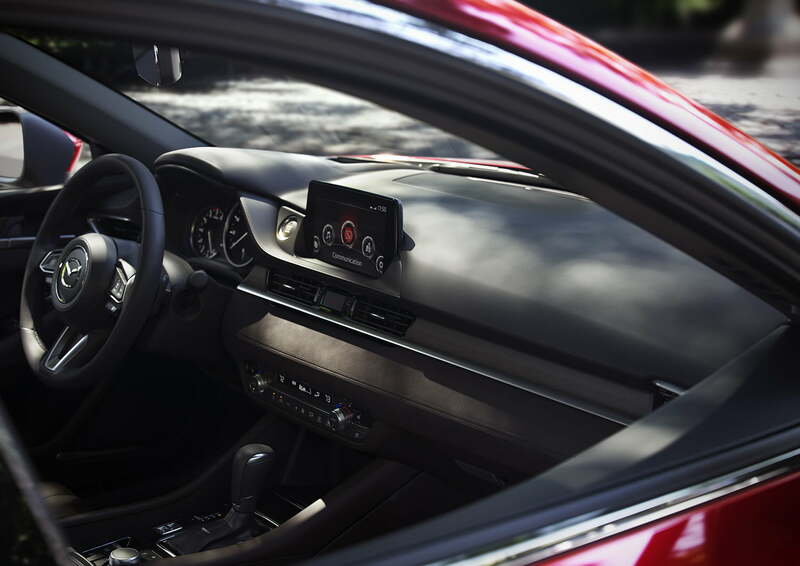 Lastly, Mazda’s i-Activsense also equips the company’s latest 360-degree View Monitor system, allowing for full views of the exterior of the car from the inside when parking or maneuvering at low speeds. Be sure to check out Mazda’s stand at this year’s Los Angeles Auto Show if you’ll be in town anytime from December 1-10.